Being a trustee of ‘There for you’ (working name of UNISON Welfare) is a challenging but highly rewarding role. Trustees are responsible for directing the charity in line with our mission and ensuring the organisation is managed effectively. UNISON Lead Negotiator in the Northern Ireland Health service responding to the public announcement of a pay deal for NHS workers in England will seek to ensure full funding will be available to ensure our workers have the full benefit of the deal applied to them. We will be meeting other unions, the Department of Health and employers to advance this. The pay deficit already suffered by health workers in Northern Ireland must be ended. 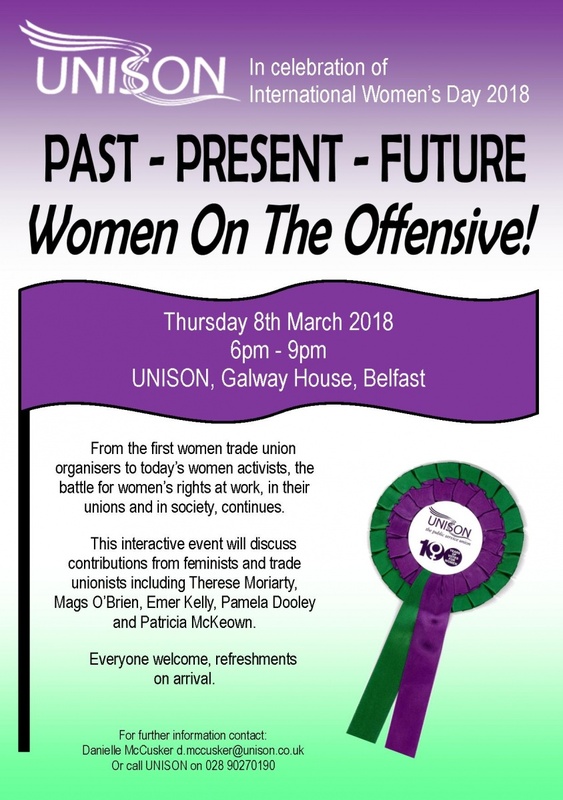 Thursday 8th March 2018, 6pm-9pm, UNISON Galway House Belfast. From the first women trade union organisers to today’s women activists, the battle for women’s rights at work, in their unions and in society, continues. The new UNISON Lottery has arrived. Relaunched on 1 February, all members can enter the monthly draw for as little as £1 a month and be in with the chance of winning prizes up to £1,000. It’s also a powerful way to support There for You, the charity for UNISON members. Every year, more than 3,000 members and their families come to There for You for help – often in desperation, with difficulties in their personal lives. UNISON president and hospital catering assistant Margaret McKee gives a rousing speech at the union’s women’s conference in Liverpool. Ms Mckee works at the Royal Victoria hospital in Belfast and told conference of the challenges she sees her colleagues and patients facing. The great-granddaughter of Emmeline Pankhurst and granddaughter of Sylvia Pankhurst spoke of the ‘feminist moment’ we are having today, when she spioke at UNISON’s biggest ever women’s conference. Dr Pankhurst has just written a book entitled Deeds Not Words. Speaking at the annual women’s conference in Liverpool today (Friday), UNISON general secretary Dave Prentis said: “In recent months a lid has been lifted on a sordid and seedy world, one we hoped we’d left behind. A world where rich and powerful men see women as objects, play things, and pawns in their quest for control. That was the rallying call to delegates at UNISON’s Black members’ conference from president Margaret McKee, speaking in Liverpool this morning. Building the union was essential, she said, because of “the challenges we face from the Westminster government … a government determined to undermine working people”. UNISON have joined the ICTU campaign to sign a petition to protect jobs at Bombardier.